Instrumental version. 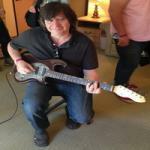 Played on a very special guitar belonging to a dear friend that I lost many years ago. Walter Roberti - Guitar, Video, Recording, and Mixing.